When we moved into my house the only things we kept were the refrigerator and the washer / dryer set. I’ve since replaced the washer / dryer and have been tolerating the refrigerator because it works. Well, it works except for the ice maker. That was broken from the start. We tried to fix it but then realized it has something to do with our water pressure. So, I started to buy bags of ice. I don’t know how much they cost. Let’s say $3 or so (give or take a dollar). For 4 or 5 years I would buy ice and each time I did it I would get annoyed because it’s FROZEN WATER and WATER IS FREE. But I still did it for the convenience factor. Well, a few months ago I said that I would stop buying ice and just make my own. 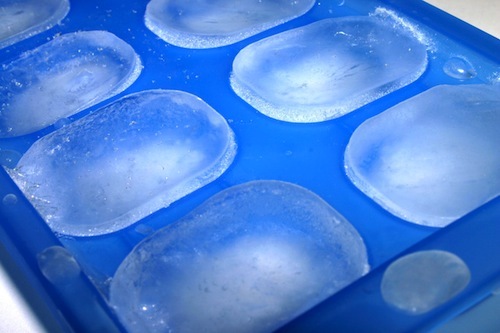 I happened to have one ice tray and told Bill that I had to go to the store to buy more. Days turned into weeks and weeks turned into months and I’ve never remembered to get the second and third tray to help out with my ice making adventures. The other day I was getting the ice out of my one tray and realized that I have exactly what I need. Why do I need more than one tray? It does what it has to do and I am able to drink cold drinks without spending extra money on nonsense. Where does this thought of MORE MORE MORE come from and why is it so deeply embedded? I’m telling you it was like an eye opener. At that moment, I realized I didn’t need a thing and it doesn’t always have to be efficiently perfect. Of course if I had more ice trays, I would be able to make more ice at once and I suppose that is a better usage of time. But really? It’s not the end of the world if I have to refill the tray each time I get myself a drink. A few extra seconds is not a loss at all. If only I could take that attitude with everything else in life, right? I don’t NEED the new iPhone or a new MAC laptop… but those suckers wake me at night because of how badly I WANT them. BUT WHY? I have a perfectly amazing computer and phone already. I see that now. This ice tray is doing more to me than it originally intended. I’ve been shocked into everyday minimalism. I guess the point is to try to live within our means. All the stuff we WANT really isn’t necessary. Odds are everything we NEED is already in our possession. Very well said Vera, imagine what the world would be like if we all lived within our means…a much happier place I suspect! Ha – I buy ice because I think it’s a convenience item I’m willing to pay for. It’s worth the $1.49 for me to not have the responsibility of making ice for my whole family. I rarely “want.” I think it’s a blessing – I know a few people who are so obsessive about what they *don’t* have they are blind to all they *do* have.